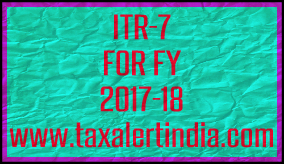 CBDT has issued ITR-7 form for the financial year 2017-18. Earlier the department issued income tax return form ITR1(Sahaj), ITR2, ITR 3, ITR4S and ITR 5 for financial year 2017-18. The department also notified that ITR-6 form will be uploaded very soon. However ITR-7 is only available in java format whereas all other ITR form for FY 2017-18 are available in both java and excel format.